On February 23, 1903, the United States signed a lease with Cuba for a 45 square mile chunk of land on Guantanamo Bay on that island, a lease for $2000 per year, payable in gold, and lasting in perpetuity (forever). Known by the US military as Naval Station Guantanamo Bay, it is the oldest US naval base outside the United States. Used as a coaling station (when ships were powered by coal) and as a general purpose naval base, the station known as “Gitmo” has since 2002 housed a prison for suspected terrorists captured during the War on Terror. In the wake of the overwhelming US victory over Spain in the Spanish-American War in 1898, the US brokered a treaty with Spain in which Cuba was granted its independence. The US Navy had seized Gitmo during the war, and the US decided the location was an important spot for a naval base in the Caribbean, eventually signing the 1903 treaty with the Cuban government to lease the base forever. The US promised no restriction on movement of Cuban ships and trade, 2-way extradition, and that while the US exercised sole control over the area while occupied by the US, the land and adjacent harbor ultimately still belongs to Cuba. In 1974, rent went up to just over $4000 per year, but of course, Cuba has long complained about the US presence and has made repeated demands for the US to leave, saying that the treaty/lease was signed under duress by a new and weak Cuban government under pressure from the much larger and more powerful United States. Since the communist regime took over Cuba under Fidel Castro in 1959, free travel back and forth between Gitmo and Cuban territory has stopped, and the presence of the US military in Cuba has been a festering sore to the Cuban government. 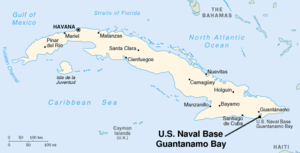 Since the communist takeover of Cuba, Gitmo has become a fortified camp, protected by fences and mine fields. 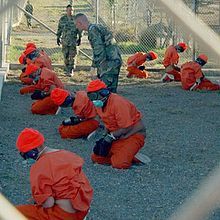 In 2008, Candidate for US President Barack Obama promised to close the Guantanamo Bay Detention Camp, as the prison is called, as it had become a source of controversy across the world, with the US accused of keeping people there for years without charges or proof of guilt, and perhaps torturing inmates as well. Although Obama managed to decrease the number of prisoners at Gitmo from 245 to only 41, he was never able to get Congress to agree to completely closing the Detention Camp. President Trump in 2017 ordered the prison to remain open indefinitely. (Note: Some of the former inmates at Gitmo were released to their home country or another country willing to take them, while most were transferred to prisons overseas.) A total of around 779 people have been held captive at Gitmo since 2002, including an unknown number of inmates less than 18 years old (perhaps around 20 or so). The Guantanamo Bay Detention Camp remains a target of civil rights and human rights activists around the world and has triggered heated debate in the United States. Several lawsuits from prisoners and various other entities have been filed, and the prison has stayed open, garnering the US no end of criticism and enmity from many other nations. 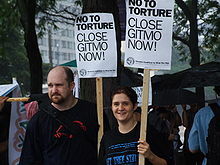 Please share your thoughts on what we should or should not do about the terrorist prison at Gitmo, and why alternatives would or would not be a better choice. Cucullu, Gordon. Inside Gitmo. HarperLuxe, 2009. Dewitt, Don. U.S. Marines at Guantanamo Bay, Cuba. iUniverse, 2011. Rosenberg, Carol. Guantnamo Bay: The Pentagon?s Alcatraz of the Caribbean. Herald Books, 2016. Next Article February 24, 1942: Canada Interns Japanese Canadians!